The Aid Stations will have water, fizzy drinks, sandwiches, pizza, cake, sweets, chocolate, sausage rolls, crisps and other such energy and carb delights!!!!!! In regards to the water we are trying to cut down on our plastic use. So will have larger bottles to empty into your water bottles. We will have cups available to drink at the stations. The Car Park is operated by a pay and display and has 73 spaces plus six blue badge holders’ spaces. If using this car park you will enter the Bishops Palace via the rear entrance (directly opposite the entrance to the car park. It will be sign posted. This is a large Car Park. It is approximately ½ Mile from the Bishops Palace. 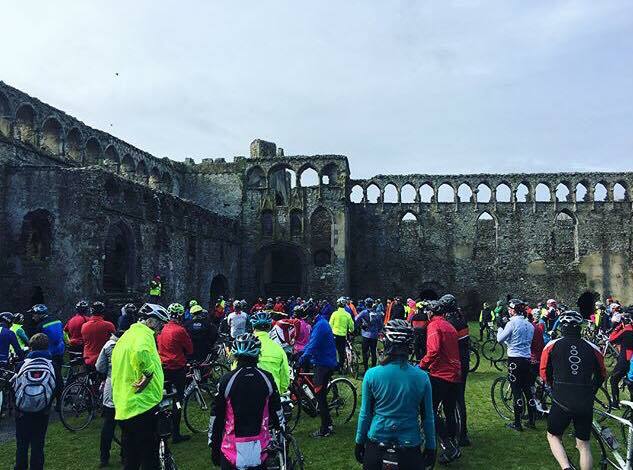 There will be approximately 200 persons taking part so if people car share and those staying in St Davids cycle to the Palace in the Morning we fully expect the first two car parks to cope with the demand. The Route and Safety briefing will follow in a couple of days. But the route can be viewed on the website and please note as stated it has changed from last year. The course is sign posted and will have marshals at some locations. The Marshals are for guidance, they have no power to stop traffic. We do not provide printed maps, there is a copy of the map online for you to view. Man-Up UK We are an all inclusive brand with the ethos that anyone can achieve anything and it's all about overcoming your limits!